Stars and stripes and open gas cans. The races are even zippier on the card. When you get your motorcycle license, you’re agreeing to a potential future of road rash and head trauma; particularly if you’re young, full of cocky self-assurance or “swagger,” and looking to impress girls by popping wheelies or Christ Airs. Even if you’re the most cautious motorcyclist on the road, car drivers can’t see you and probably won’t hear you unless your cycle is louder than their music or “def jams.” As a motorcyclist, you have yourself, the road, and incompetent cars to contend with, and it’s this reality that Zippy Race recreates perfectly. In Zippy Race, you guide a racer on a motorbike from Los Angeles to New York and parts betwixt. There are five levels total – L.A., Las Vegas, Houston, St. Louis, and Chicago – before you reach your final destination of the Big Apple. 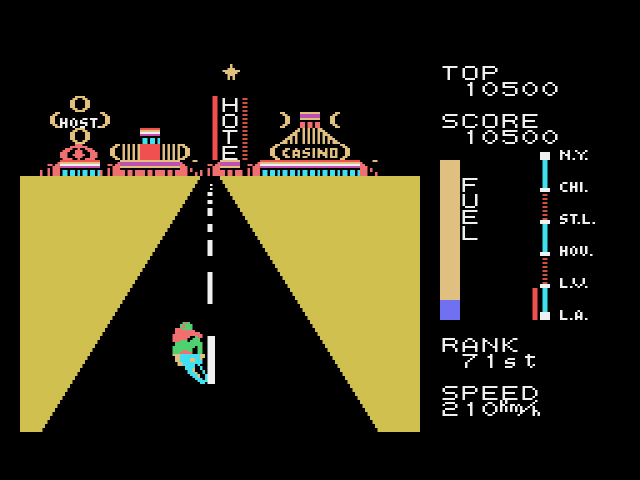 Each level consists of two portions: a top-down section comprised of homicidal motorists, sharp twists and turns, and road obstacles – cacti and boulders in the desert landscape of Las Vegas, for example; and a behind-the-biker approach that showcases your current destination while cars drive head-on towards you. The motorists have intriguing A.I. : while they will try and crash into you, you’ll often have to drive close to get them to cease their movement towards you. Driving your cycle close to an oncoming car is counter-intuitive, but the idea that a car will stop proceeding towards your cycle the closer your cycle gets is eerily similar to how the road operates in reality. Unlike real life, you can crash your bike as much as you want without losing a life, but every time you crash, your ever-dwindling fuel meter lowers a bit more. Run out of fuel and the game’s over. Thankfully, there are additional gas cans you can collect on the road. As you drive, you’ll also gain ranks for every car you pass. The more cars you pass, the higher your rank at the end of the stage. The higher your rank, the more bonus points you receive, bonus points which elevate your fuel for the next stage. That’s right, you don’t get a full tank upon completion of a stage. You have to earn fuel. Fuel equals respect, and respect is never purchased with money unless you’re a celebrity. 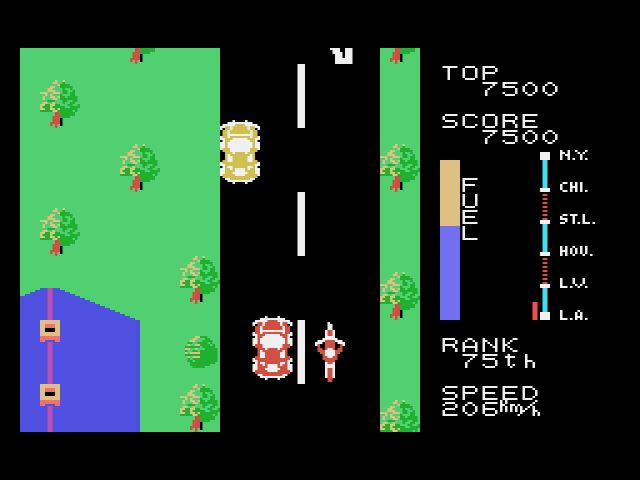 If you’re an American gamer of a certain vintage, you’ve probably played Zippy Race and not even known it. 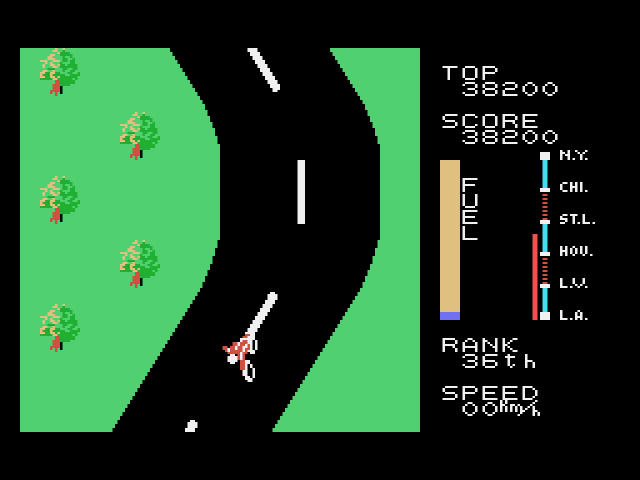 Zippy Race was released in American arcades in 1983 as MotoRace USA. Why the name change? 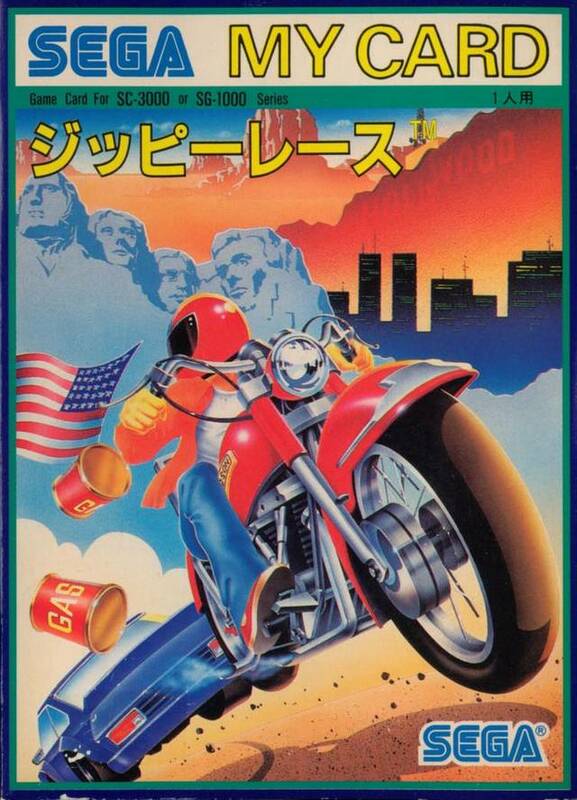 Probably because R&D at Irem’s American division showed that Zippy Race was too fun and fancy-free of a name for Reagan’s “Morning in America.” Zippy Race was also released on the Famicom in Japan, re-released on Sega’s My Card series, and bundled with two other games in Irem Arcade Classicsfor the Sega Saturn and Sony Playstation. Meh, I didn’t want to go to St. Louis anyway. Compared to other SG-1000 games, Zippy Race is surprisingly expansive. 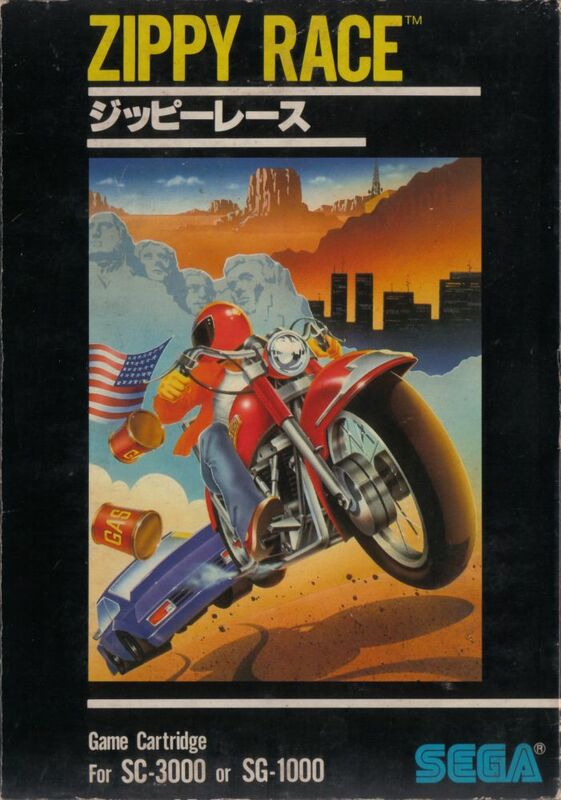 The cross-country journey gameplay gives the game an epic feel that I would argue most arcade and console games (including the Famicom) lacked at the time. The controls for the bike are sharp and responsive, while the graphics are some of the best I’ve seen on the system (silly car designs notwithstanding). Zippy Race has considerable replay value, as well. After you’ve beaten the game, you’re placed back in L.A. with a faster bike, a full tank of gas and the long, open road. The first journey by itself will take you some time to conquer, so this “second quest” is a nice addition to an already packed game. As a whole, Zippy Race is one of the finest SG-1000 games I’ve played thus far, and an arcade port at that. I’m grateful for the streak of solid games I’ve been playing, but there’s no need to think these positive trends will continue. Soon the SG-1000 bubble shall burst. Soon, but not today. You’ve got some serious patience to finish this yawn-inducing game. It plays alot slower than the arcade game, also called Traverse USA.